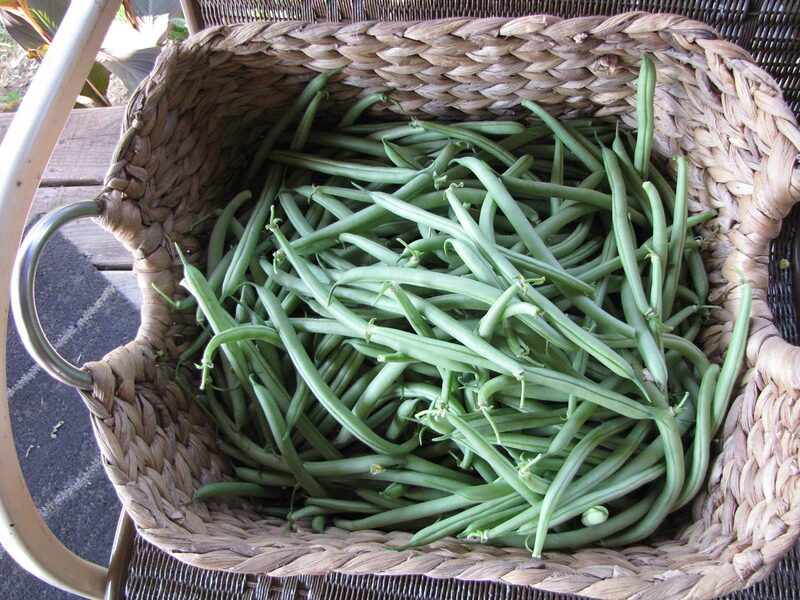 This is the first basket of our new-to-us Strike green beans. This spring, I not only planted two double rows of Provider green beans in the main garden but also three single rows in the Central garden. So I’ve been picking and canning beans every other day. That was bad enough (good enough? ), but then I discovered I’d also planted two single rows of Strike green beans as well. Will and I have been wanting to trial these beans, which in two University trials, out-produced Providers. We thought “Oh Sure!” because we didn’t think it could be done. But wow, lots of beans and they are a little more refined than Provider, being nice and straight, a little longer, and more slender. For the first picking yesterday I got nearly a basket full that translated into five quarts and six pints of very nice beans. And the first picking is always less; there are tons more coming on strong. They’re a definite keeper! 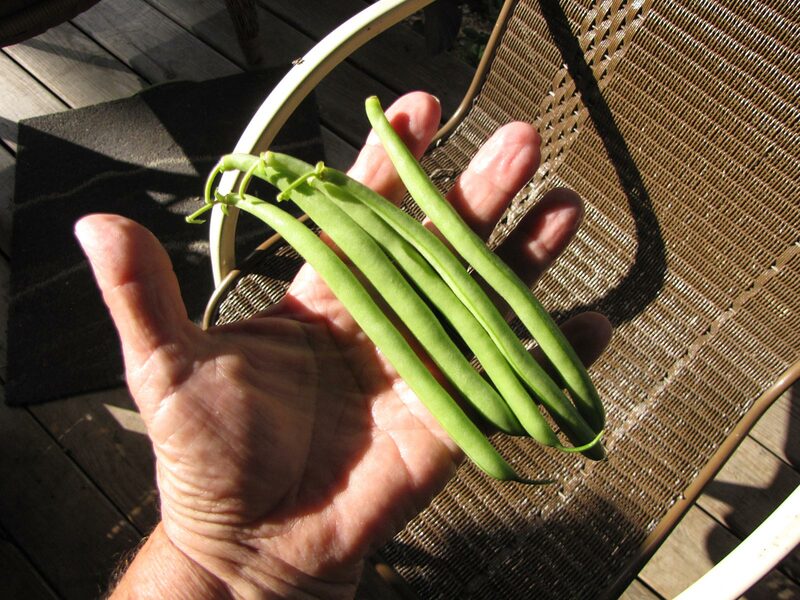 Aren’t these Strike green beans nice? There sure are lots of them. The past two years, I’ve been working hard to build Monarch butterfly habitat. That included sowing milkweed seed around the homestead, planting lots of butterfly friendly flowers and making sure they always had plenty of blooming flowers all season long. After all, it had gotten so that I didn’t see one Monarch all year for three years in a row and only one the year before that. I was rewarded this summer as I’ve already seen several happy Monarchs flitting from flower to flower. Hopefully they have beautiful babies who will return next year. 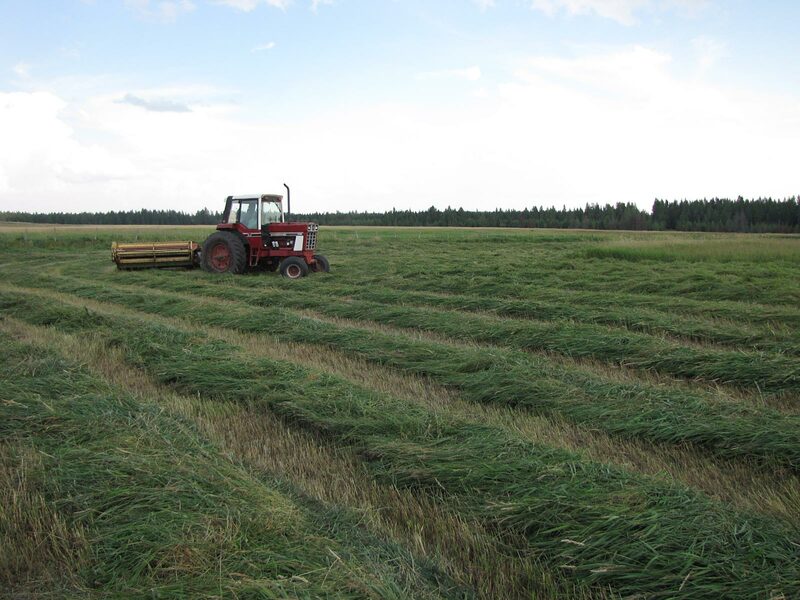 Will is out baling up a huge field of hay, making use of this dry week. Yesterday, he cut another large field so it will be ready to rake tomorrow. That’ll put a whole lot of hay in our storage lot for winter. We really could use some rain though. I’m watering the gardens and orchard and the pasture is pretty dry. But I hope it holds off until most of the hay has been baled up. Will hard at work cutting more hay to feed our animals all winter long. I’m sure missing our apprentice, Alisha. Working with someone so enthusiastic and fun makes work go by so fast! This pretty sunset lit up our yard. Not where I live. But every area is different and where I live there are different varieties of milkweed and one of them doesn’t look like the others. You can look at photos online in free copies of ebooks. You can also use Google Images – just type in wild lettuce and compare it to your milkweed. No. They’re different plants entirely. What I miss in Provider and Contender is that wonderful Blue Lake bean taste. They just don’t have it. Hope Strike has it. You’ll have to try some of our Crawford pole beans then. They make Blue Lakes taste like cardboard~! I really like the taste of Providers every bit as much as Blue Lakes and they are much more productive. Jackie, you are my inspiration and have been for many years since we first found your columns in Backwoods Home,have all your books and your canning one has my most fave receipe for salsa! My hubby has 4th stage lung cancer, nearly loss him a couple of times,but he rally’s each spring to plant our 3 raised gardens. About now each year,I think, WHAT has he done to us?! Lol! My kitchen counter is filled with poblano peppers,cukes,tomatoes, banana peppers,etc. our day today is filled with dr apts( for me, I am also in process of going thru 3 surgeries this upcoming year) down in Omaha,of course it will be nearly 90, but better than in snow! I dry a lot of the produce. I canned a dozen jars of salsa last week, took me two days, but then I remember why we need to plant less! Lol! Or not!~ I always think maybe next year we’ll get hailed out (been there;done that! ), or injured (gee, I’ve been there; done that too) or develop some health issue (yep, there was 2005 when I was busy fighting off cancer). So I usually plant a whole lot and try to get a lot canned up and dehydrated. Amazing how similar our weather is 300 miles apart. Very dry here too. Do you plan on selling Strike come Spring for seed? Strange cause we are located 50 miles west of Sioux Falls, SD. We have rain here and its so nice to get rain. We have been getting rains and we are so thankful! We have had some dry years and borderline moisture close to the drought areas on the maps but not this summer. Definite yes, there. Between Strike and the extremely wonderful Crawford beans we are growing this year, we are SO tickled with our beans. My friend, Dara, was here today and she tried a Crawford bean raw and said “Oh my God! What a wonderful bean!” And I picked another big basket of Strike today. From ONE row! I’ll be looking forward to ordering some of the Strike beans next year! Hope you get some of that well-needed rain soon. How does plant size on Strike compare with provider. 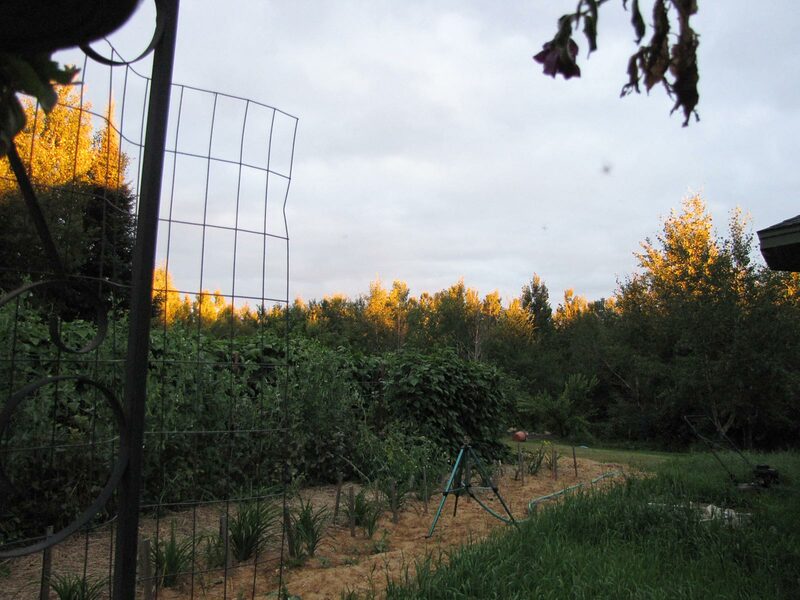 I grow my beans in a three foot wide raised bed in the center of one hoop house that is twenty feet long. I transplant then through IRT plastic on both sides of two runs of drip tape. The providers end up hanging over into the walkways and anything that is bushier would croud things too much. I would like to try Strike for next year. For us, the Strike plants seem more upright and the beans seem to hang in bunches, making picking real easy. But as a first year planting, I can’t guarantee it would be that way for everyone…or even us next year. Your talk of butterflies got me thinking of bees. My husband and I have them here in North Georgia, and I was wondering if you and Will have or have considered beekeeping. Is your area conducive to beekeeping? You know, if winter is the problem, I think they would do well in a vented greenhouse (open in the summer). Their value as pollinators is course primary, but oh, the honey! We would LOVE to have bees. I raised and enjoyed them years ago when we lived in Sturgeon Lake, MN. But, unfortunately, Will is very allergic to stings. Epi-pen allergic. He does seem to be getting less allergic as he has been stung a few times in the past few years and not had a terrible reaction or needed to use the pen. So we do have hopes in the future…. We both LOVE honey! This is the first time I’ve ever seen other comments AND your replies. I always assumed that you were extremely busy and only had time to post. Yep, extremely busy. But I love visiting with folks via the blog! Don’t give up sending in questions to the magazine, though, or the ASK JACKIE column will go away if it’s not used enough. Oh oh!! Oh no..I must have missed a post. What happened to Alisha? Check Jackie’s previous post on August 7. Alisha just went home for a bit to see her family. These are the exact words from fmy husband then from me. Two 80′ rows of Provider! I have lost count of the number of cases canned!! Sitting here this evening snaping beans. So much bounty. God be praised! +Praised indeed! I canned more beans today and will be picking more tomorrow as well as canning applesauce, apple butter and apple juice. Yep, our apple trees are putting out well this year. Monarchs love milkweed; it’s about the only thing they lay their eggs on and the larvae feed on. But I also have planted butterfly weed (orange) and lots of blooming flowers all over the yard. I’ve seen them on Bloomerang lilacs, my daylilies, petunias and many more. I’m so happy to see them! Glad your truck is working again! Those beans are beautiful! Will you have seed for them for sale ? At the rate they’re producing, we’ll be able to offer plenty of Strike seeds, plus eating lots and lots of beans. Beautiful beans! How stringy are they? Bush or running? Oh, and Strikes have no string at all. You and Will work so hard and are a true inspiration to your readers! I enjoy your posts and look forward to reading each and every one of them! Thank you Heather. We just keep plugging along. And I’m truly grateful my health has been good and I’m able to get things done I want to. Mostly! Hey, we all want to do more than we actually do…..